Hospice nurse Laura Brown checks Shawn Jordan's heart in his mother’s house, in Haskell County, Texas. HASKELL COUNTY, Texas — To get to the house where Shawn Jordan wants to die, you drive a hypnotic road along miles of furrowed cotton fields, gnarly mesquite trees, low-to-the-ground cactus, and cattle perpetually in search of food. This iconic land of open spaces and oil pumps, where the Panhandle meets west Texas, is where the 43-year-old came home after a car accident he said should have killed him. 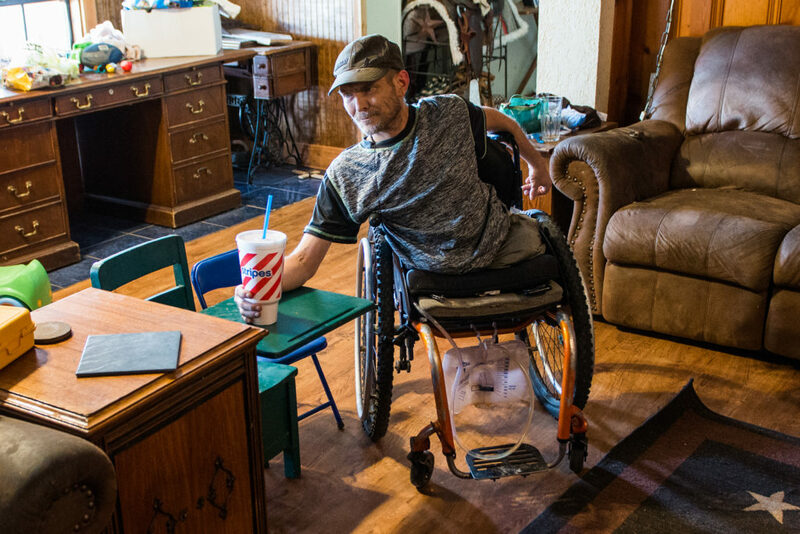 He’s since had his paralyzed legs amputated, and survived seven MRSA infections. He’s been in hospice care since that last infection, because he knows the eighth could be his last. 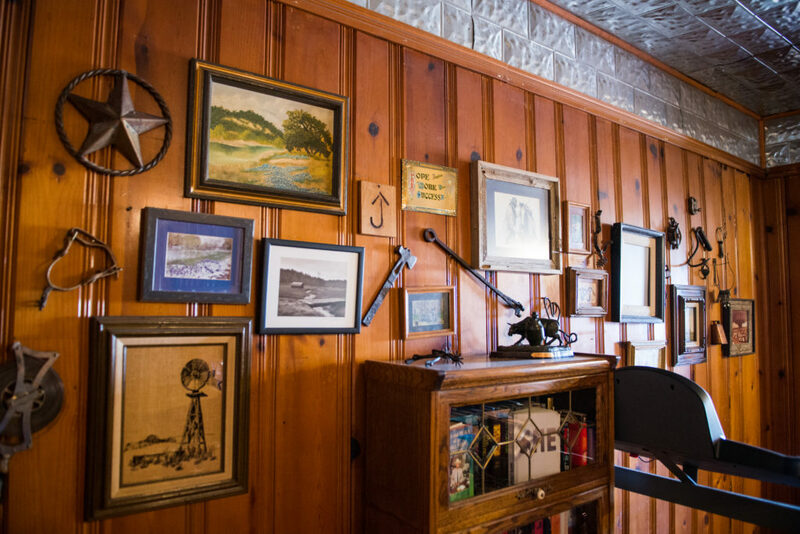 And he wants to spend his remaining time here, with family, surrounded by the rocking horse and toys of his toddler grandson, as well as emblems of the working west — antique spurs and ranch hooks on the wall, tin stars, and a saddle in a corner by the door. It’s his country. It’s home. Jordan’s wish is not unusual — most people who enter hospice want to die at home, even if they often don’t. But in rural Texas, where rugged individualism defines both the relationship to the land and the hesitation to ask for outside help, many don’t sign up for hospice until their very last days. And when they do, the long distances and often empty miles mean long hours for nurses, arduous trips to the hospital, and extra work for caregivers who have to learn basic medical care. 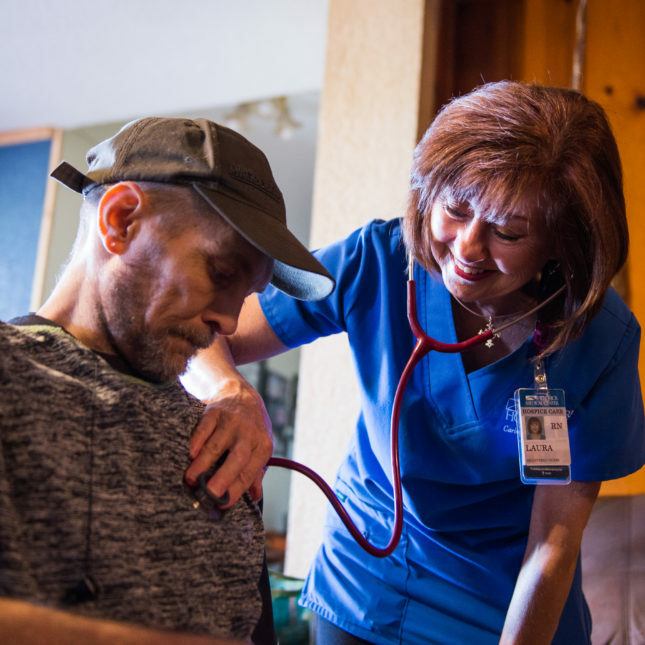 Hospice providers in the more remote western and southern parts of the state shared stories with STAT of nursing shortages, scheduling gymnastics, run-ins with wildlife, and the wear and tear of long days in cars for the men and women who treat people at home. Distance sometimes forces hard conversations: At the moment they and their caregivers need help most, a nurse may not quickly be at their side. On a recent afternoon, a routine nursing visit to check on Jordan seemed straightforward — he needed a new colostomy bag. It turned out to be anything but. 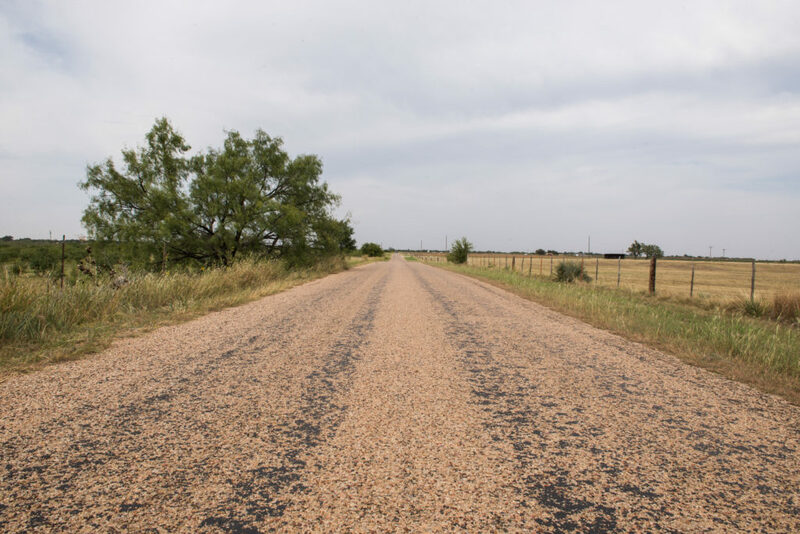 The once-paved road that leads to the house where Jordan lives in Haskell County, Texas, is flanked with mesquite, cotton, and wild grasses. It’s not easy to find people who will do hospice nursing in this part of Texas. The hours are irregular, and nurses are often on-call. A 250-mile day isn’t unheard of. For registered nurse Laura Brown, it’s what you have to do to care for sick people. Before joining hospice, she was an infusion nurse, giving cancer patients chemotherapy. She was used to patients dying as much as living. “I go wherever they send me,” she said, listing off small towns that rise up after miles of open land, just to disappear a minute later in a rearview mirror. Brown had not seen Jordan in a while — his regular nurse was on vacation, and she was filling in. He would be her second stop on a day that eventually covered 220 miles from home to patients and back again. Brown works for Hendrick Hospice Care, affiliated with Hendrick Medical Center in Abilene. After seeing patients at the hospice facility in the city, she talked to Jordan by phone, grabbed supplies, including a colostomy bag, and got on the road. 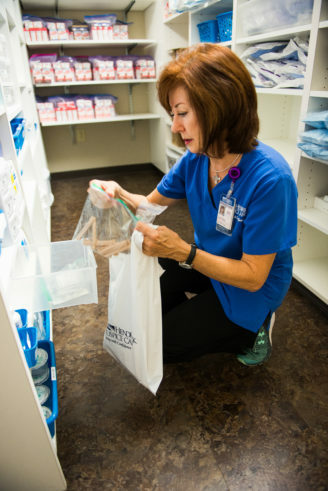 Brown gets supplies from Hendrick Hospice Care in Abilene, before heading out to see patients. As with many hospice nurses, her car is her office — a fuel-efficient, white four-door with a blue cooler for lunch and snacks, and plenty of space for supplies. On the roughly 50-minute drive to Jordan’s house, she took a phone call about another patient who needed help with medications. Such multitasking, she said, is fairly common. Hendrick serves people in 13 counties in a 65-mile radius from Abilene. The standard across the state, according to industry officials, is to be able to get to patients in about an hour. For their home cases, nurses see about four people per shift, said Hendrick director Karen Tucek. They are dispatched in a “spokes on a wheel” formation, moving in one direction and stopping along the way before heading back — Brown started her day 25 miles south of Abilene, then wended her way 50-plus miles north. Jodi Fry, another nurse working that day, headed east from Abilene, seeing patients in a loop that easily reached 100 miles. The roads get rough fast outside small cities like Abilene, and help, while a phone call away, may take a long time to get there. Tucek, like other providers, told stories of nurses and aides getting stuck on the road and needing a vehicle with four-wheel drive to dislodge them. She spoke of run-ins with deer. Nancy Kernell, a nurse and the owner of Area Community Hospice in Plainview, described night runs on dark Panhandle roads. Kernell said she’s been looking for a nurse for two months, and there are times when her hospice is short-staffed. When that happens, she adds herself to the call schedule. Councilman, of Hospice of San Angelo, said to better cover her sprawling service area, she tries to find nurses who live outside the city. Still, there are gaps, so her organization uses telemedicine. “We are constantly on the phone with our patients, triaging, giving medication suggestions, while we are on the way out there,” she said. The living room of Jordan’s home. He began living there with his mother after an accident that eventually cost him his legs. Before his wreck, he helped build out the living room with one of his sons. Jordan waits for his hospice nurse to return with a colostomy bag. He’s been fighting MRSA infections since the 2013 accident and fears the next one will be his last. Texas has nearly 500 hospice providers, but 60 percent of its counties do not have a single provider, according to 2015 data — the latest available — compiled by Cordt Kassner, CEO of Hospice Analytics. Most of those counties are classified as rural by the U.S. Department of Agriculture, but even many of the counties classified as urban are really not — they are one county over from a large town or small city, and the distances are still significant. Use of hospice by eligible patients is only slightly less in rural counties than in urban ones, but Kassner’s data make clear that rural residents enter hospice much later than those living in or near cities: The average length of stay for rural residents is 63 days. For urban residents, it’s 81. Overall, about half the people who are eligible for hospice services in the state actually use them, which is slightly higher than the national average of 46 percent. This is one reason why individual hospices treat people in so many counties, said Larry Farrow, the executive director of the Texas & New Mexico Hospice Organization. “It’s hard. I wish I could say that no matter where you reside in Texas, you have a hospice within 50 miles of you, but it’s not true, and it may never be true,” he said. The lack of nurses and huge areas served by Texas hospices raise possible concerns about the quality of care that people who want to die at home receive. Kaiser Health News recently reported on egregious oversights in hospice care throughout the nation, describing cases that happened in rural parts of the country. In some cases, families called for help at odd hours, and no one came. In another complaint, a provider who showed up was inexperienced, and her calls for backup went unanswered. Hospice experts told STAT that while such situations happen, it’s hard to know how often. In general, most patients and family members who contribute comments to Medicare’s Hospice Compare website seem to be pleased with the quality of care they receive. Kassner said missed calls and appointments, especially at the very end of life, should prompt a discussion of how hospice providers are paid by the Centers for Medicare and Medicaid Services. Medicare is the primary payment vehicle for hospice services and agencies are paid a day rate for patients, even if, as the Kaiser story showed, no one comes to the house. Kassner suggested that a two-tier system might work better, where on top of the flat rate, hospices would get paid extra for visits in those last few days. He and others also said that while not excusing outright neglect, the burden falls on providers that serve rural patients to set expectations as early on in the process as possible. “In rural areas, it’s a completely different setup,” Kassner said. 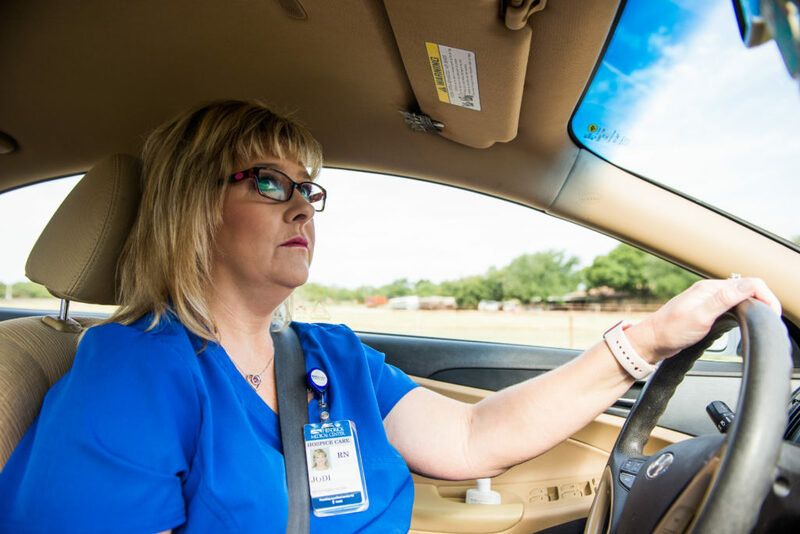 Hendrick Hospice nurse Jodi Fry heads east from Abilene to see her first patient in Clyde, Texas. Hospice managers send staff to home visits in a “spokes on a wheel” fashion to minimize travel time. Brown had to navigate from memory to find the gravel road that led to Jordan’s house; her GPS struggled with the address. Dodging toys and a new litter of kittens lounging in the shade of the front porch, she knocked on Jordan’s door. There was no answer. She called. Again, no answer. Concerned, she tried the door. It opened, and after a couple of tense minutes, she found Jordan in his bedroom, where he was trying to dress himself for the visit. Eventually, he wheeled into the living room, and the two began to talk. His eyes darted around the room, as he sipped watermelon lemonade and frequently shifted in his wheelchair. Occasionally, he’d make a joke. “At some point today, I’ll have to go get a Dr Pepper, because it’s the nectar of life,” he said, laughing hoarsely about the unofficial state beverage. Jordan shares his home with his mother, his son, his grandson, and his daughter-in-law, who, as his main caretaker, has had to learn things like how to correctly pick him up. His two other children live out of state. They were in the car with him when it flipped over a guardrail a few miles from his home. Since the accident in 2013, he’s had to deal with open wounds that won’t heal, and antibiotic-resistant bacteria that repeatedly find their way inside him. He’d lost weight, and he needed a colostomy bag that would stick well to fragile skin. But what Brown brought wouldn’t do, and after some quick internet sleuthing, she left. First, she hit a pharmacy in town — it didn’t have the right style. Then, she went to a nursing home nearby. A little begging, a little borrowing, she recalled later, and she got the bag. She was back at Jordan’s in under an hour, but the whole trip took more than two hours, not to mention her next stops, and the drive home. She spoke highly of Jordan, and his will to live — and accept death — without regrets. One of his wounds has since started draining fluid — a fearful sign, he said this week, that the eighth infection might be underway. And Jordan is equally respectful of the nurses who come to see him. Hospice nurses are often referred to as angels, because of when they enter people’s lives and the work that they do. But Brown bristled at the idea that she was an angel. Her work, she said, is a privilege. “Kassner suggested that a two-tier system might work better, where on top of the flat rate, hospices would get paid extra for visits in those last few days.” There IS a two-tier system in place. It is called a “service intensity add on”. They hospice is reimbursed an hourly rate on top of the daily rate for visits made by an RN or Social Worker during the last 7 days of a patients life. Very interesting article. We are a non profit hospice serving 20 Counties in East Texas. Our home office is in Gregg County and there are 18 hospices here. The market is so flooded that it is difficult for any of us to survive. Bravo for hospice nurses, and for all nurses, we all do a great job, although sometimes we say that we are just doing our job. I worked in a hospital, but took care of in-patient hospice, and patients consider us as family. That is such a great honor. I had a 28 y.o with end stage cervical cancer, and she asked if I can be her mom, I was astounded, had tears, it was a humbling experience, so I said yes. Her mothewr lives in Los Angeles and can not really afford to come to Pennsylvania, so she adopted the staff to be her family. She had an 8 y.o girl, her husband, and her brother. Having been a hospice nurse for 15+ years I cannot more heartily agree with Ms. Brown. It is an honor and a privilege to care for individuals and their families as their lives are drawing to a close. To be invited to walk with them and their families is a sacred and humbling experience. Thank you so much for your hard work and service. Wonderful story from start to finish. The world needs more hospice nurses and more grateful patients like Jordan. Thank you STAT for excellent reporting. Great story. The pictures of Jordan and his home and those of nurses Jodi and Laura add so much more realism and inspiration to those of us who would never know. I really don’t know what my family and I would have done without hospice for my husband after all his cancer treatments failed.He wanted to die at jomw where he could see his family one last time and I was determined to give him his last wish and hospice was our last hope.They were wonderful to us and I think everyone that is dying should be allowed to do as they wish. How does one become a hospice nurse. Hi Ellen: If you already have a nursing degree, then I’m sure one of your local agencies can help you find a job. If not, I know a lot of non-profit hospices work with volunteers. Perhaps that route might work too. Thanks. I worked for hospice for 7 years and your story is so correct.hospice nurses work so hard.amen! Thank you, Katherine. Feel free to email me. I’d love to hear more. Political bs.Its all about The insurance companies saving millions of dollars when they stop opioids.altogether and they will win eventually!! !more people die every day from hundreds of reasons than opioid s simple logic!! !